The petrous part of the temporal bone is pyramid-shaped and is wedged in at the base of the skull between the sphenoid and occipital bones. Directed medially, forward, and a little upward, it presents a base, an apex, three surfaces, and three angles, and houses in its interior, the components of the inner ear. The petrous portion is among the most basal elements of the skull and forms part of the endocranium. Petrous comes from the Latin word petrosus, meaning "stone-like, hard". It is one of the densest bones in the body. Left temporal bone. Outer surface. The petrous bone is important for studies of ancient DNA from skeletal remains, as it tends to contain extremely well-preserved DNA. The base is fused with the internal surfaces of the squamous and mastoid parts. 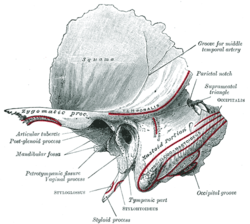 The apex, rough and uneven, is received into the angular interval between the posterior border of the great wing of the sphenoid bone and the basilar part of the occipital bone; it presents the anterior or internal opening of the carotid canal, and forms the postero-lateral boundary of the foramen lacerum. near the center, the arcuate eminence (eminentia arcuata), which indicates the location of the superior semicircular canal. above this canal the shallow trigeminal impression for the reception of the trigeminal ganglion. The posterior surface forms the anterior part of the posterior cranial fossa of the base of the skull, and is continuous with the inner surface of the mastoid portion. Near the center is a large orifice, the internal acoustic opening, the size of which varies considerably; its margins are smooth and rounded, and it leads into the internal auditory meatus a short canal, about 1 cm. in length, which runs lateralward. It transmits the facial and acoustic nerves and the internal auditory branch of the basilar artery. The lateral end of the canal is closed by a vertical plate, which is divided by a horizontal crest, the falciform crest, into two unequal portions. Each portion is further subdivided by a vertical ridge into an anterior and a posterior part. In the portion beneath the falciform crest are three sets of foramina; these openings together with this central canal transmit the nerves to the cochlea. in front of and below the first is the tractus spiralis foraminosus, consisting of a number of small spirally arranged openings, which encircle the canalis centralis cochleæ. The portion above the crista falciformis presents behind, the area cribrosa superior, pierced by a series of small openings, for the passage of the nerves to the utricle and the superior and lateral semicircular ducts, and, in front, the area facians, with one large opening, the commencement of the canal for the facial nerve (aquæductus Fallopii). Behind the internal acoustic meatus is a small slit almost hidden by a thin plate of bone, leading to a canal, the aquæductus vestibuli, which transmits the ductus endolymphaticus together with a small artery and vein. Above and between these two openings is an irregular depression that lodges a process of the dura mater and transmits a small vein; in the infant, this depression is represented by a large fossa, the subarcuate fossa, which extends backward as a blind tunnel under the superior semicircular canal. Anterior inferior cribriform area, with (5’) the tractus spiralis foraminosus, and (5’’) the canalis centralis of the cochlea. situated between the tympanic portion and the mastoid process is the tympanomastoid fissure, for the exit of the auricular branch of the vagus nerve. The superior angle, the longest, is grooved for the superior petrosal sinus, and gives attachment to the tentorium cerebelli; at its medial extremity is a notch, in which the trigeminal nerve lies. The posterior angle is intermediate in length between the superior and the anterior. Its medial half is marked by a sulcus, which forms, with a corresponding sulcus on the occipital bone, the channel for the inferior petrosal sinus. Its lateral half presents an excavation — the jugular fossa — which, with the jugular notch on the occipital, forms the jugular foramen; an eminence occasionally projects from the center of the fossa, and divides the foramen into two. The anterior angle is divided into two parts—a lateral joined to the squamous part by a suture (petrosquamous), the remains of which are more or less distinct; a medial, free, which articulates with the spinous process of the sphenoid. At the angle of junction of the petrous and the squamous parts are two canals, one above the other, and separated by a thin plate of bone, the septum canalis musculotubarii; both canals lead into the tympanic cavity. The upper one (semicanalis m. tensoris tympani) transmits the tensor tympani. the lower one (semicanalis tubae auditivae) forms the bony part of the auditory tube. In ancient DNA studies, scientists extract and sequence DNA from ancient skeletal remains of humans and other species. In many cases the DNA is highly degraded, and contaminated by DNA from soil microbes. In 2015 it was found, surprisingly, that the petrous bone has remarkably well-preserved DNA. A 2017 study comparing DNA from different skeletal sites concluded that "The inner part of petrous bones and the cementum layer in teeth roots are currently recognized as the best substrates for (ancient DNA) research ... Both substrates display significantly higher endogenous DNA content (average of 16.4% and 40.0% for teeth and petrous bones, respectively) than parietal skull bone (average of 2.2%)." Consequently, petrous bones are now the most widely-used skeletal site for the study of ancient DNA. ^ Pinhasi R, Fernandes D, Sirak K, Novak M, Connell S, Alpaslan-Roodenberg S, Gerritsen F, Moiseyev V, Gromov A, Raczky P, Anders A, Pietrusewsky M, Rollefson G, Jovanovic M, Trinhhoang H, Bar-Oz G, Oxenham M, Matsumura H, Hofreiter M (18 June 2015). "Optimal ancient DNA yields from the inner ear part of the human petrous bone". PLOS One. 10 (6): e0129102. doi:10.1371/journal.pone.0129102. PMC 4472748. PMID 26086078. ^ Hansen HB, Damgaard PB, Margaryan A, Stenderup J, Lynnerup N, Willerslev E, Allentoft ME (27 January 2017). "Comparing ancient DNA preservation in petrous bone and tooth cementum". PLOS One. 12 (1): e0170940. doi:10.1371/journal.pone.0170940. PMC 5271384. PMID 28129388.